Ever grabbed your semi-automatic pistol to rack the slide and had trouble overcoming the stiff recoil spring (or springs, since many of today’s pistols have dual recoil springs)? Have your shooting buddies or gun shop salesmen recommended revolvers to make things easier? 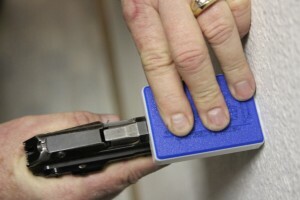 Whether you struggle with slides due to injury, arthritis or just insufficient grip strength, a gunsmith in Iowa has come up with a brilliantly simple solution to help you enjoy your semi-autos again. Chris McAninch was approached by a customer requesting modifications to his firearm to make it easier to use. Rather than permanently modifiying the pistol, Chris invented the Handi-Racker. The device works by gripping your pistol’s slide with enough clearance in front of the barrel to allow charging the pistol by placing the device against a table, wall or other flat surface and pushing the firearm frame forward. It is similar in principle to the old “rear sight on the booth heel” tactical one-handed reload method but with more predictable results and less chance of damaging your firearm. The accessibility device comes in several color-coded sizes: the small will fit micro pistols; the medium works with compact pistols like Ruger’s LC9 and Kahr’s CW9; and the large model accommodates full size pistols including 1911s and most Glocks. Coming soon is an extra-large model for use with wider, full-sized .45 pistols. The small model has a trough to accommodate your front sight while the larger models have cutouts for this. All models are made in the USA of non-marring material. The Handi-Racker isn’t just for those who have trouble manipulating the slide under normal conditions, either. I can think of several occasions when I wish I would have had such a device; most notably the full-sized Beretta whose slide would lock up tight after firing the steel-cased ammo my range buddy brought on our shooting trip. I would have felt a lot better nestling the pistol safely into a Handi-Racker to give it some “encouragement” than putting the front of the slide right on the bench and slapping it around. You can find Handi-Rackers at Brownells as well as various other retailers and distributors at around $20. Learn more at the manufacturer’s website.